In one of the most daring operations of WWII, a number of British midget submarines (known as “X-craft”) ventured into Norway’s fjords in order to sink or put out of commission the German battleship Tirpitz. 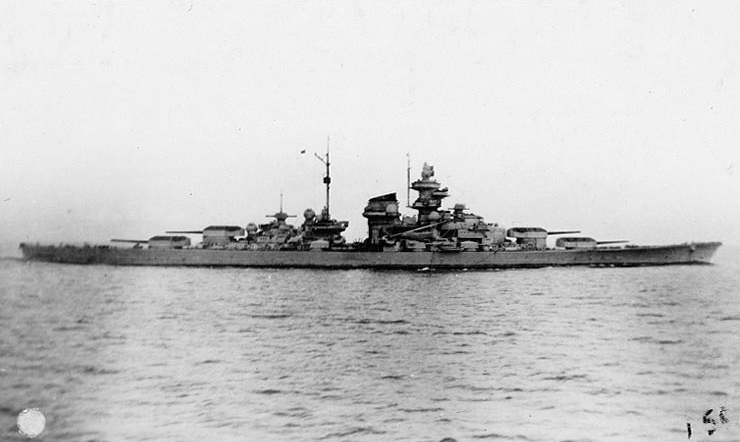 Though the Tirpitz was not sunk, it was severely damaged and kept out of action until the following spring. Unfortunately, a number of the British vessels did not return: their crews were either captured or perished in the deep. In the last few years, unexploded charges from some of the British submarines were found in Norway, close to the Tirpitz’s anchorage, showing that even the missing craft had reached their target. 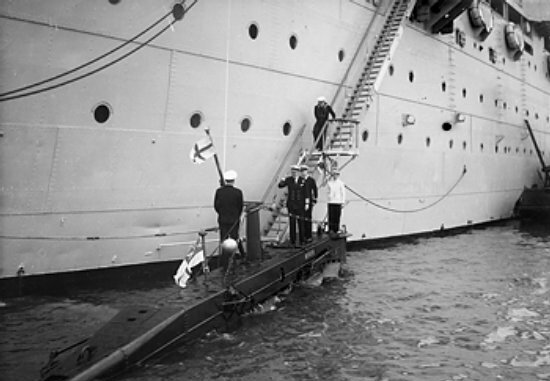 This mission, code-named Operation Source, was given mixed reviews by the high command of the Royal Navy, but the value of the X-Craft had been noted. 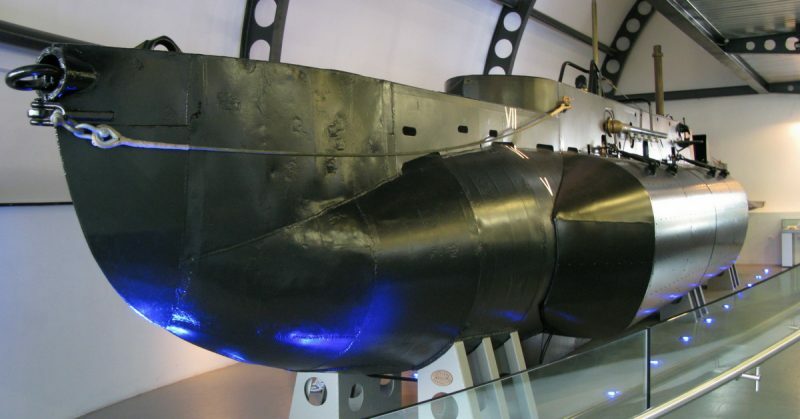 Operation Source, combined with British experience with manned torpedoes (both their own and their Italian enemies) showed that there was a future for miniature submarines, in combat, reconnaissance, and in dropping off and retrieving agents into and from occupied Europe. Tirpitz underway, probably in 1941. 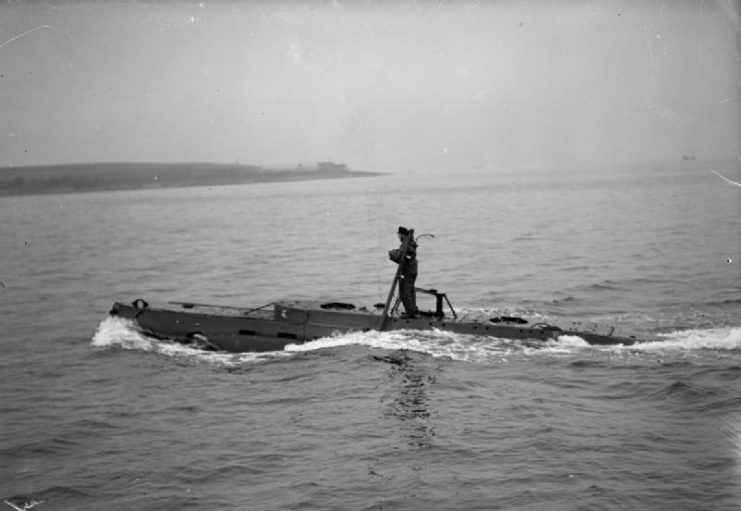 The X-craft went through a number of modifications during the war, and there was a small variety within the “X-class submarines” as they were more properly known, but generally speaking they were: crewed by four men (commander, diver, engineer, pilot), 51.25 feet in length and weighed 27 tons (30 submerged). They were 5.75′ in width and had a shallow draft of just over 5 feet. They were powered by a 42 horsepower Gardner engine with a top speed of 6.5 knots surfaced/5.5 submerged. They tested to a depth of 300 feet and had an operational range of 500 nautical miles surfaced/82 submerged (at a minimum speed of 2 knots). The vessels’ sole weapons were two one ton explosive mines, held to the enemy hull magnetically. The charges were triggered by a timer. 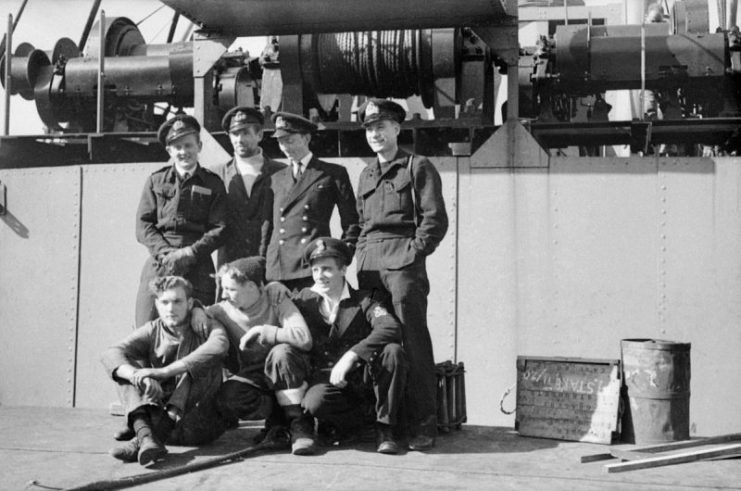 Lieutenant Henty-Creer, RNVR and the crew of X 5, one of the midget submarines that made a successful attack on the Tirpitz at Alten Fjord, on the deck of a ship. Though these vessels were theoretically capable of traveling long distances on the surface and almost one hundred miles submerged, these were under ideal circumstances. No one realistically expected the subs to operate over those long distances or in the open ocean, though cross-Channel missions in decent weather were not out of the question. Most, but not all of the time, the subs were launched from larger vessels. However, the midget subs could remain at sea for days. The crew by necessity had to be small in size, and definitely not claustrophobic. They also had to get along. Essentially, they were operating in a large hot closet. 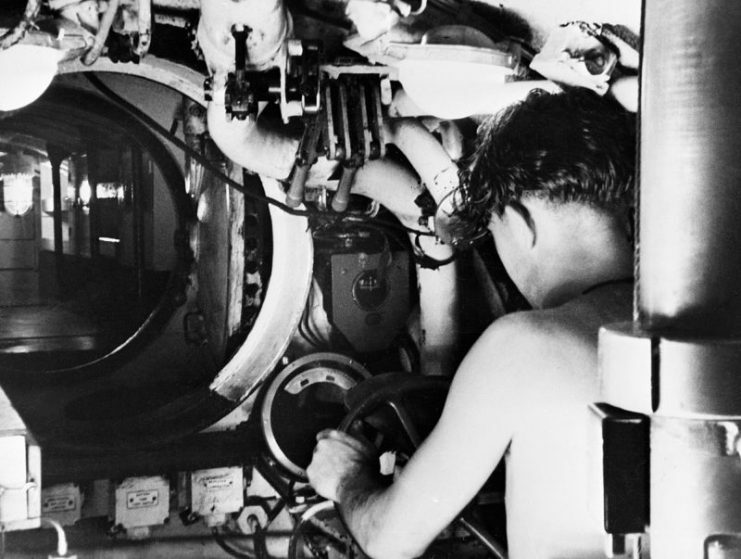 The crew were also keenly aware of a couple of design flaws, the first being that the crafts’ periscope was too short, which meant that in less than ideal conditions, the submarine could become visible when the periscope was deployed. The second feature was deadly too, and had proven to be in the Tirpitz raid: there was only one escape hatch. 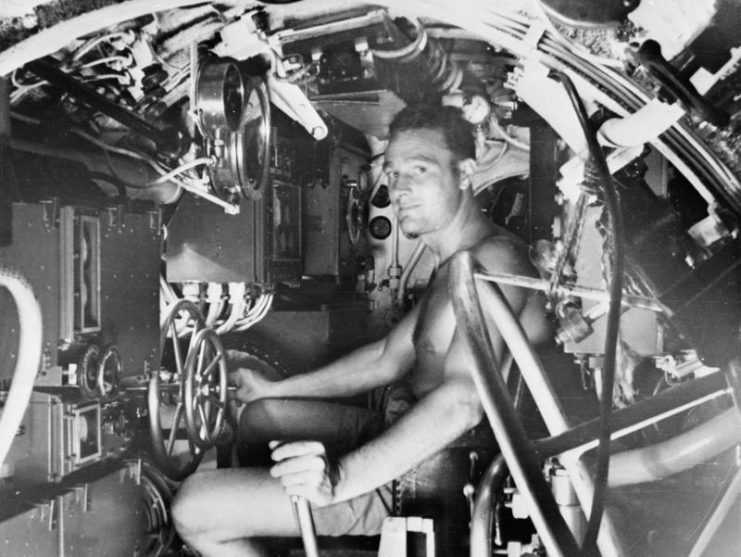 Stripped to the waist and framed in gauges and controls, one of the crew of a midget submarine at his action station. 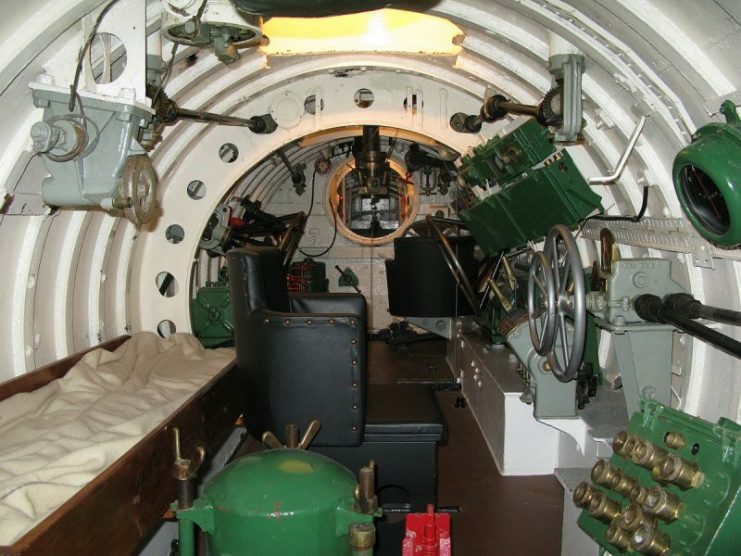 The mini-submarine was one of the British Pacific Submarine Fleet based out of Sydney, Australia. In April 1944, another midget sub attack was launched in Norway, which sank a merchant vessel and damaged a large floating dock. The relative success of the Norway missions and the subs’ potential, combined with upcoming events (“Overlord,” the cross-Channel invasion) meant that the Royal Navy continued plans for their use. An X-Craft under way in Loch Striven, near Rothesay. Within the plans for Overlord was “Operation Gambit,” the deployment of midget submarines off the coast of Normandy before the invasion. Months before the landings, observations and tests needed to be carried out on a number of beaches to make sure they were suitable for the operation. Tides needed to be verified, defenses scouted, the capability of the sand to carry vehicles and much else needed to be checked. Resistance fighters, spies, frogmen, and reconnaissance planes did their part, and so did the midget submarines. 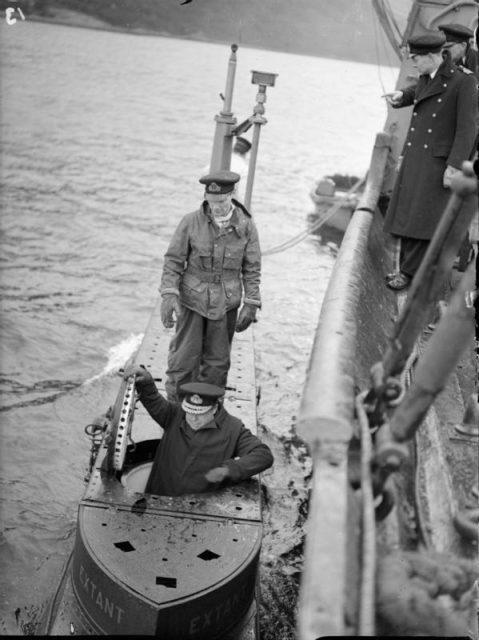 Rear Admiral C B Barry, DSO Flag Officer Submarines, entering the conning tower of the midget submarine HMS EXTANT at Holy Loch during an inspection. The sub X-20 was supposed to observe the beach code-named “Sword” (which saw invasion by British troops in June), but it first ended up to the west at Omaha Beach, which fell to the Americans to invade. Launched on January 20th, 1944, and driven to the point of exhaustion by their journey to the French coast from the south coast of England, the crew carried out its mission at Omaha, bringing back vital information about existing defenses, tides, etc. Five days prior to the original invasion date of June 5th, two X-craft took position off the French coast at the beaches code-named Sword and Juno (“Canada’s beach”). Once they arrived on the coast, they submerged in the relatively shallow water and waited for the signal that the invasion fleet was on its way. Occasionally, they would surface to check position, look out for enemy ships, and check activity onshore. On one occasion, they spotted German troops playing soccer on an open section of beach (hence, no mines). The crew also listened to the BBC for a coded message that would tell them that the invasion was underway. On the night of the 4th, they heard a message which told them that the invasion was going to be delayed a day. This would make things a bit more dicey than they already were, as the subs’ oxygen supplies were limited and surfacing was risky. Still, the mission was the most important of the war, so the subs remained in place. Late on June 5th, the crews received the message that the invasion was proceeding. At 4 am on June 6th, the subs raised a special mast with a bright navigation light that only pointed out to sea. This was to be used as a beacon for the approaching fleet so that they would both find the correct beach and avoid previously scouted natural obstacles. Radio beacons and an echo device had been installed on the submarines as well, which allowed them to communicate with the mine-sweepers that would be approaching the beaches in the fleets’ vanguard. 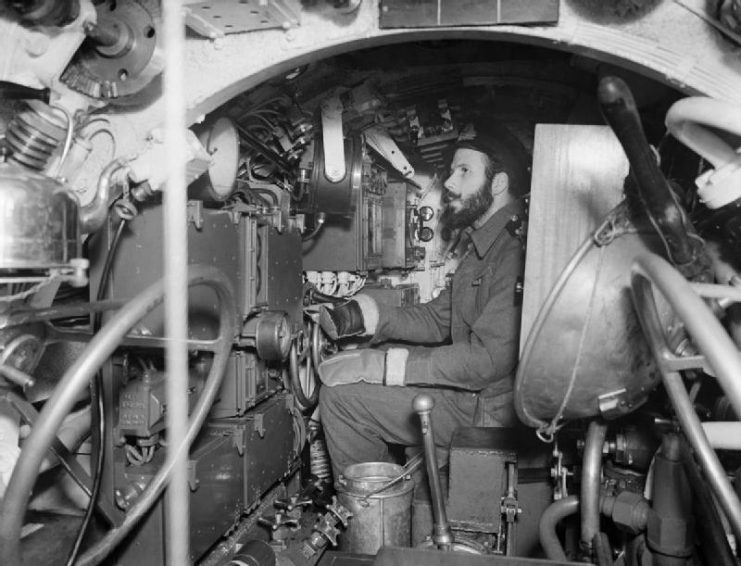 A submariner at the controls of a Royal Navy midget submarine in Sydney, Australia, 1945. The value of the X-craft in the invasion should not be underestimated. Though they only operated at two of the five invasion beaches (the other beach falling under British control was “Gold”, which was situated between the British and American beach at Omaha, making navigation a bit easier), the landings took place exactly as had been planned, virtually all troops landing exactly where they were supposed to. The Americans had declined the Royal Navy’s offer of the X-craft: many of the units at Omaha Beach landed away from their designated places, and many of the initial Utah landings came ashore thousands of yards from their assigned places (though in the end this turned out to be a blessing – the original landing places being more heavily defended). For the men on Juno Beach a very hard day lay ahead, but it was made less so by the brave men aboard the X-craft.